Lu Bird Baby: They're here!!! Because most of the time she is found here. so I grabbed a Sharpie marker and took a picture of it right next to the nest. 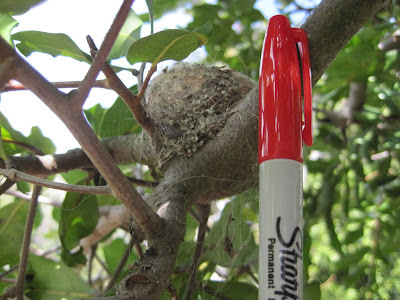 As you can see the nest isn't even as big as the cap to the Sharpie. How wonderful that they are here and so tiny. We get humming bird every year they love our flowers and some are babaies I can't believe how small they are. How wonderful! 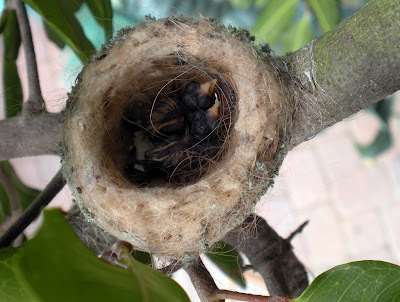 We had baby hummingbirds in our yard last year that I got to see hatch & take pics of too - it was such a gift to witness!! They grow so fast it is amazing!! Love hummingbirds! So teeny-tiny. Thanks for sharing!